TSK savunma sanayiye özel söndürme sistemleri, savunma sanayi ve güvenlik teşkilatları için tasarlanmış özel bir söndürme sistemidir . 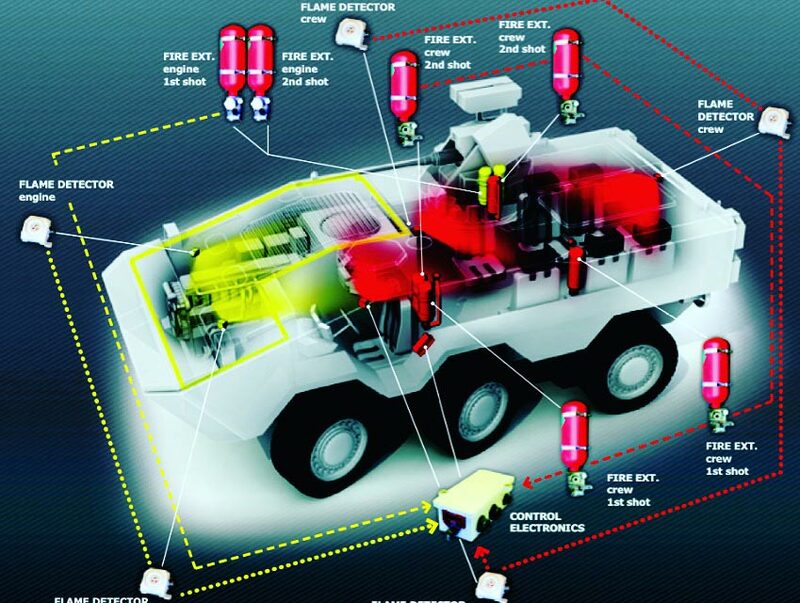 This fire suppression system is designed especially for the defense industry and security services. Despite of armouring of car, fire can be resulted from excessive heat of engine or wheels’ ignition caused by attacks. 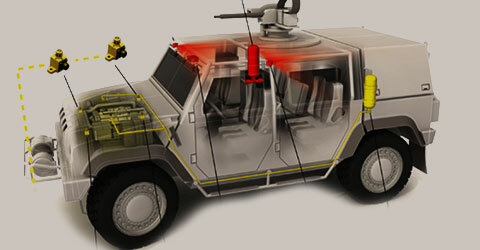 Therefore, specially designed automatic fire suppression system for vehicles will be the ideal solution for such cases. These type systems operate automatically and manually. The control unit of the system is mounted so that the driver always can easily manage it. In the system of motor part as fire suppression means will be applied NOVEC 1230 or water mist fire suppression. In personal and passenger part have strictly to be used the gas FM200 or NOVEC 1230 against exterior sabotage. Otherwise, the personal existed in passenger part will be seriously harmed. The wheels are important part of cars, but they are not fireproof that contact with any flammable and explosive substances for 30 and 60 seconds is enough for burning down. Thus, we must not forget that the wheels are made of crude oil and for their suppression acceptable powder and water mist extinguishing systems. Especially water mist suppression is ideally suited for extinguishing because of its cooling effect by high pressure. In incidents the cars are hiding place for security personal from possible risks. This also concerns to passengers and transport vehicles. Flammable and explosive substances emitted to outside of car can ignite the surface within 2 minutes. This situation can lead to very serious consequences for the security forces. Of course this situation can be prevented by several measures. The most suitable extinguisher for exterior surface of vehicles is a foam extinguisher. 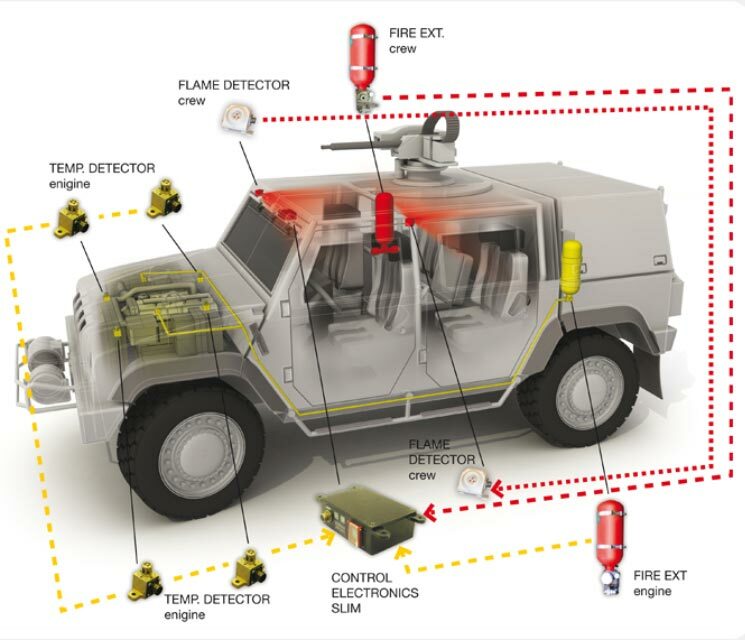 Automatically and manually operation of system easily and rapidly suppresses the flame on car surface by nozzles connected to the system. These type systems operate automatically and manually. The control unit of the system is mounted so that the driver always can easily manage it.